A new alliance is uniting Carnegie Mellon University's unrivaled machine learning capabilities with the University of Pittsburgh's world-class health sciences expertise. "The complementary strengths of the alliance's partner institutions will allow us to reimagine health care for billions of people in our shared data-driven world," said Subra Suresh, president of CMU. "Through this collaboration, we will move from reactive care to immediate, proactive prevention and remediation, from experience-based medicine to evidence-based medicine, and to augmenting disease-centered models with patient-centered models." The Center for Machine Learning and Health (CMLH) at CMU is one of two centers being launched under the umbrella of the Pittsburgh Health Data Alliance. Andrew Moore, dean of CMU's School of Computer Science, said he is excited about the potential for innovations emerging from the new CMU center to empower people to make better health care decisions. "A doctor might ask, 'Three weeks into the course of treatment, how do my patients' charts compare with similar people?' The possibilities are intriguing," Moore said. The CMLH will be led by founding director Eric Xing, who was awarded an IBM Open Collaboration Research Award in 2012, to develop novel ways to use big data to search for associations between genetic variations and their links to outcomes such as major diseases. "Eric is the perfect person to direct this center. He is a world leader in the field of machine learning and an expert in computational biology and chemistry," Moore said. 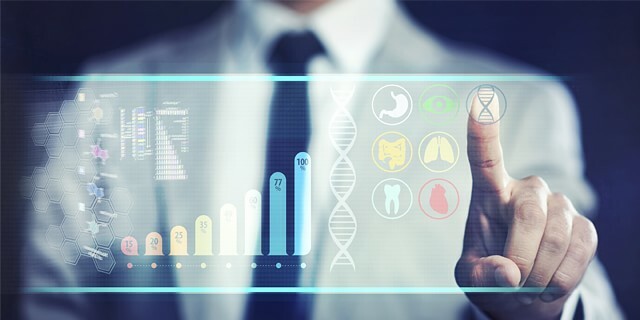 The CMLH will focus on five areas: big health care data analytics; personalized medicine and disease modeling; issues of preservation of privacy, security and compliance in the context of big data; data-driven patient and provider education and training; and a new general framework for big data in health care. "We envision data-driven medicine based on the experience of many thousands of actual patients that will produce targeted, not generic, assessments of an individual's disease risk and make personalized recommendations for treatment," Xing said. Xing said a near-term project he envisions at the CMLH is the development of an automated patient diagnosis system. A doctor could query this system to determine possible diagnoses for a set of symptoms and lab findings. The system would search medical literature and analyze collections of patient data to provide possible diagnoses. The system could also suggest additional questions that the physician might ask the patient, or tests that might be ordered, to refine the diagnosis. The second center funded by UPMC is the Center for Commercial Applications and Global Healthcare Data at the University of Pittsburgh, which will research and invent new technology for developing individualized therapies for various diseases. Scientists from all three institutions will participate in each center. 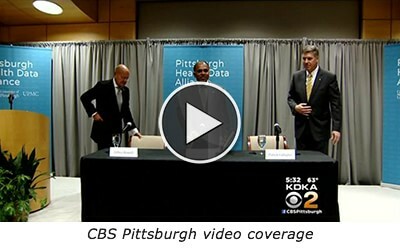 CMU, Pitt and UPMC have a long history of successful collaboration at the intersection of health and data science. For example, the use of smart data to help hospitals and doctors rapidly detect potential disease outbreaks and immediately alert staff and authorities to take appropriate actions is the focus of the Real-Time Outbreak and Disease Surveillance (RODS) Laboratory at Pitt. Moore was a collaborator in this project as a CMU professor. A similar approach is taken at the Event and Pattern Detection (EPD) Lab at CMU's Heinz College. At EPD, Pitt and CMU collaborated on a project to detect disease outbreak by tracking over-the-counter medication sales. A current EPD Lab project, funded by UPMC, is developing a framework for using large data sets, including electronic health records and insurance claims, to uncover patterns of care that have significant potential impacts on patient outcomes from mortality, to length of hospital stay and frequency of readmission. The new research centers at CMU and Pitt will be funded with 10 to 20 million dollars per year over the next six years by UPMC and also will benefit from several hundred million dollars in existing research grants at all three institutions. The alliance goal is to streamline and accelerate the process of moving innovations from discovery to real-world application. UPMC Enterprises, the commercialization arm of UPMC, will lead the efforts to turn these innovative ideas into new, for-profit companies and jobs. "Not only will this effort benefit patients, but it will also accelerate Pittsburgh's revitalization," said UPMC CEO Jeffrey Romoff. Moore knows something about economic development and the impact of innovation at CMU. He was a CMU professor in 2006 when Google tapped him to start the Google Pittsburgh Lab at the university. The Google operation began with a handful of employees at the Robert Mehrabian Collaborative Innovation Center on CMU's campus. This facility houses numerous companies, such as Apple and Disney, who have established a footprint at CMU to pursue collaboration opportunities and tap into CMU's world-class research and development capabilities. Google now employs hundreds of software engineers and has been the anchor for the Bakery Square development in East Liberty, now in its second phase. This in turn has resulted in new housing, retail and service providers that have transformed this once blighted neighborhood into one of the city's most coveted destinations. Moore said he expects new industry partners will want to locate near CMU and Pitt to participate in the research and development at the Data Alliance's new research centers.